“Outrageous! That’s what you’ll say when you read how the biotechnology companies have manipulated the government, our food, and the media, and put an entire generation at risk. Just as the magnitude of the industry’s plan was breathtaking, so too are the distortions and cover-ups. While many of the stories in this book reveal government and corporate maneuvering worthy of an adventure novel, the impact of GM foods is personal. Most people in North America eat them at every meal. These chapters not only dismantle the U.S. position that the foods are safe, they inform you of the steps you can take to protect yourself and your family. When eminent scientist Arpad Pusztai went public about his accidental discovery that genetically modified (GM) potatoes severely damage the immune system and organs of rats, he was suspended from the prestigious Scottish research institute where he had worked for thirty-five years. He was silenced with threats of a lawsuit while the Institute denied or distorted his findings. In the ensuing war over public opinion, biotech advocates tried to spin the science in favor of GM foods, but were thwarted at each attempt by leaked documents and compelling evidence. Pusztai, who describes this chapter as “the most thorough and accurate report on the topic,” was ultimately vindicated when his potato study was published in the Lancet. His remains the only independent safety assessment in a peer-reviewed journal. It contrasts sharply with the handful of published industry studies, an analysis of which reveals how they were designed to avoid finding problems. When Susan answered the door, she was startled to see several reporters standing in front of her. Several more were running from their cars in her direction and she could see more cars and TV news vans parking along the street. Susan took the paper. “Arpad, come here,” she called to her husband. Arpad Pusztai (pronounced: Are-pod Poos-tie), a distinguished looking man in his late sixties, was already on his way. As his wife showed him the document, the reporters slipped past them into the house. But Arpad didn’t notice; he was staring at the paper his wife had just handed him. He recognized the letterhead at once–The Rowett Institute, Aberdeen, Scotland. It was one of the world’s leading nutritional institutes and his employer for the previous thirty-five years–until his sudden suspension seven months ago. And there it was, clearly spelled out. They had released their gag order. He could speak. The document was dated that same day, February 16, 1999. In fact, less than twenty minutes before, thirty reporters had sat in the Rowett Institute press conference listening to its director, Professor Phillip James, casually mention that the restrictions on Dr. Pusztai’s speaking to the press had been lifted. Before James had finished his sentence, the reporters leaped for the door. They jumped into their cars and headed straight to the Pusztai’s house on Ashley Park North, an address most were familiar with, having virtually camped out there seven months earlier. Now those thirty reporters, with TV cameras and tape recorders, were piled into the Pusztai’s living room. Arpad Pusztai read the document–twice. As he looked up, the reporters started asking him questions all at once. He smiled, and breathed more easily than he had in a long time. He had all but given up hope. Now he finally had the chance to share what he knew about the dangers of genetically engineered foods. The story of Arpad Pusztai made headlines throughout Europe for months, alerting readers to some of the serious health risks of genetically modified (GM) foods. It was barely mentioned, however, in the U.S. press; the media watchdog group Project Censored described it as one of the ten most underreported events of the year. In fact, major U.S. media avoided almost any discussion of the controversy over genetically modified organisms (GMOs) until May 1999. But that was all about saving the monarch butterfly from GM corn pollen, not about human food safety. It wasn’t until the massive food recall prompted by StarLink corn that Americans were even alerted to the fact that they were eating GM foods everyday. Moreover, the American press was forced to question whether GM foods were safe. Up until then, the media had portrayed European resistance to America’s GM crops as unscientific anti-Americanism. But as the story of Arpad Pusztai reveals, the European anti-GMO sentiment had been fueled, in part, by far greater health risks than the scattered allergic reactions attributed to StarLink. Mice avoid eating GM foods when they have the chance, as do rats, cows, pigs, geese, elk, squirrels, and others. What do these animals know that we don’t? At the end of each chapter is a one-page story describing how farmers, students, and scientists discovered that animals refuse to eat the same GM foods that we consume everyday. The Washington Post reported that laboratory mice, usually happy to munch on tomatoes, turned their noses up at the genetically modified FlavrSavr tomato. Scientist Roger Salquist said of his tomato, “I gotta tell you, you can be Chef Boyardee and mice are still not going to like them.”  The mice were eventually force fed the tomato through gastric tubes and stomach washes. Several developed stomach lesions; seven of forty died within two weeks. The tomato was approved without further tests. Genetic engineers continually encounter unintended side effects–plants create toxins, react to weather differently, contain too much or too little nutrients, become diseased or malfunction and die. This chapter describes the process of genetic engineering and twenty-one ways in which it can create unexpected, potentially serious problems. What was happening to the Canadian scientists in 1998 amounted to “re-runs” of what U.S. government scientists faced in the 1980s. When FDA scientists tried to blow the whistle on what was happening, they were stripped of responsibilities or fired. The FDA eventually approved rbGH on the basis of a research summary submitted by Monsanto that had distorted and deleted data about serious health effects, including cancer. The FDA’s article states, “it has also been determined that at least 90 percent of bovine growth hormone (bGH) activity is destroyed upon pasteurization of milk. Therefore, bGH residues do not present a human food safety concern.”  Robert Cohen decided to investigate this claim. He uncovered what he considers to be blatant scientific fraud. The research had been conducted by undergraduate Paul Groenewegan. His three co-authors all had close ties with Monsanto. The paper described how they heated milk at 162 degrees F for thirty minutes. Cohen said, “when I read that, I said, wait a second, milk is pasteurized for 15 seconds at that temperature–not 30 minutes. They intentionally tried to destroy the hormone…. That must have been their mission. Why else would they heat the milk for 30 minutes at a high temperature reserved for a 15 second treatment?” But even after thirty minutes only 19 percent of the bGH in milk from hormone-treated cows was destroyed. In 1989, first dozens, then thousands fell sick. About one hundred people died, others struggled with paralysis, unbearable pain, and debilitating symptoms. Authorities eventually tracked its cause: contaminants produced in one company’s genetically modified variety of the food supplement L-tryptophan. This chapter describes the evidence implicating genetic engineering as the cause of the epidemic and the efforts by industry and the FDA to divert the blame. Current regulations are so loose, they would allow that same type of deadly supplement onto the market today. Henry Miller was in charge of biotechnology issues at the FDA from 1979 to 1994. According to Miller, “U.S. government agencies have done exactly what big agribusiness has asked them to do and told them to do.”  This chapter reveals how industry influence has dictated policy, and how the FDA ignored the recommendations by the majority of their own scientists by approving GM foods without requiring safety tests. By “receive the same oversight as other products,” Quayle meant that GM foods would be considered just as safe as natural, non-GM foods. And sidestepping “unnecessary regulation” meant that the government would not require any safety tests or any special labels identifying the foods as genetically engineered. The rationale for this hands-off policy was spelled out in an FDA document dated three days after Quayle’s announcement. “The agency is not aware of any information showing that foods derived by these new methods differ from other foods in any meaningful or uniform way.”  Monsanto had what it wanted: government endorsement of safety, and no regulations that would interfere with its plans for rapid worldwide sales. Attorney Michael Taylor was involved in the development of FDA policy. Prior to working at the FDA, Monsanto was his personal client. Taylor had helped Monsanto draft pro-biotech regulations that the industry would lobby for. While working for the FDA, Taylor could implement those laws himself. For Monsanto, there was no better person to step into a leadership role at the FDA. Taylor did not simply fill a vacant position at the agency. In 1991 the FDA created a new position for him: Deputy Commissioner for Policy. He instantly became the FDA official with the greatest influence on GM food regulation, overseeing the development of government policy. According to public interest attorney Steven Druker, who has studied the FDA’s internal files, “During Mr. Taylor’s tenure as Deputy Commissioner, references to the unintended negative effects of bioengineering were progressively deleted from drafts of the policy statement (over the protests of agency scientists), and a final statement was issued claiming (a) that [GM] foods are no riskier than others and (b) that the agency has no information to the contrary.”  In 1994, Taylor became the administrator at the Department of Agriculture’s Food Safety and Inspection Service, where he was also involved in biotechnology issues. He later became Vice President for Public Policy at Monsanto. When the FDA announced its policy, the public was not aware of any internal dissent. The policy boldly claimed that there was no information to indicate that GM foods were different or more risky than natural varieties. Since the American public generally trusts the FDA, people assumed that no such risks existed. But nearly a decade later, the agency’s internal documents–made public for the first time through a lawsuit–told a different story. But even the draft of the policy that Kessler praised as White House-friendly was subject to further revision as it went up the political chain of command. A memo from the Office of the Assistant Secretary for Health, at the Department of Health & Human Services, expressed reservations about the length and depth of the policy statement’s concern for environmental effects of GM crops. The letter said, “The extensive twelve page discussion seems to be … dangerously detailed and drawn-out.”  In the end, it was the political, rather than scientific considerations that prevailed. When the FDA documents eventually became public, Maryanski defended the agency’s policy. On February 28, 2000, he told the OECD Conference on GM Food Safety in Edinburgh, Scotland that the FDA scientists had merely been asking questions about the various issues involved in bioengineered food. Maryanski was unpleasantly surprised when Druker, who was a member of the conference, stood up and invited the audience to read the FDA memos that were posted on his organization’s website. They could see for themselves that the agency’s scientists were not merely asking questions; many of their statements were quite emphatic about the unique risks of GM foods. Many scientists who understood the dangers, however, were not convinced by the FDA’s assurances. Geneticist David Suzuki, for example, said, “Any politician or scientist who tells you these products are safe is either very stupid or lying. The experiments have simply not been done.”  A January 2001 report from an expert panel of the Royal Society of Canada likewise supported the conclusions of the FDA scientists. The Royal Society of Canada report said it was “scientifically unjustifiable” to presume that GM foods are safe. The report explains that the “default prediction” for any GM foods is that “expression of a new gene (and its products) … will be accompanied by a range of collateral changes in expression of other genes, changes in the pattern of proteins produced and/or changes in metabolic activities.” This could result in novel toxins or other harmful substances. An infant girl in England broke out in cold sores from drinking soymilk, but was tested as “not allergic” to normal soy. Was she allergic to something in GM soy instead? Perhaps it was the increased amount of the allergen–trypsin inhibitor–found in Monsanto’s Roundup Ready soybeans? Could this also explain why soy allergies in the UK jumped by 50 percent after Roundup Ready soy was introduced? It’s difficult to say, because although scientists have confirmed that deadly allergies can be transferred into foods via genetic engineering, there are no robust allergy tests done on GM foods. This was brought to the public’s attention only after StarLink had been blamed for severe, potentially fatal allergic reactions. It took the FDA nearly a year to develop a test to see if StarLink was allergenic. The test was so poorly designed and unreliable, even the EPA rejected the results. In March 1999, the York Nutritional Laboratory, Europe’s leading specialists on food sensitivity, reported that soy allergies skyrocketed over the previous year, jumping 50 percent. The increase propelled soy into the top ten list of allergens for the first time in the 17 years of testing York scientists tested 4,500 people for allergic reactions to a wide range of foods. In previous years, soy affected 10 percent of consumers. Now, 15 percent reacted with a range of chronic illnesses, including irritable bowel syndrome, digestion problems, and skin complaints, as well as neurological problems, chronic fatigue syndrome, headaches and lethargy. Researchers confirmed the link with soy by detecting increased levels of antibodies in the blood. Furthermore, the soy tested in the study was likely to contain significant percentages of the genetically modified Roundup Ready variety. Booth didn’t know what had caused her nearly deadly allergic reaction But this was September 2000 and within a few days she heard the news. A genetically modified corn product called StarLink, a potential allergen not approved for human consumption, was discovered in tacos, tortillas, and other corn products. More than 300 items were eventually recalled from the grocery store shelves in what was to become one of the world’s biggest GM food debacles. The biotech industry uses its considerable resources to mold public opinion on genetically modified foods. In addition to promoting a one-sided image of the foods as safe and necessary, they stifle coverage about health and environmental damage. For example, a Fox TV station canceled a news series, a publisher canceled a book contract,  scientific journals refused papers, and a printer shredded 14,000 magazines, all due to fear of lawsuits by Monsanto. Other stories in this chapter describe how the industry manipulated news that was reported. “Yet the more one learns about biotechnology’s Great Yellow Hope,” Pollan continues, “the more uncertain seems its promise.”  A closer look reveals some interesting omissions in the industry’s numbers. According to a Greenpeace report, golden rice provides so little vitamin A, “a two-year-old child would need to eat seven pounds per day.”  Likewise, an adult would need to eat nearly twenty pounds to get the daily-recommended dose. Distributing supplements is precisely what the Vitamin Angel Alliance is doing. They give children who are at risk a high potency tablet, strong enough so that only two are required per year to prevent blindness. At a cost of only $.05 per tablet, only $25,000 is needed to prevent 500,000 children from going blind per year. Contrast this with golden rice, which has cost more than $100 million dollars so far, and is not yet ready. 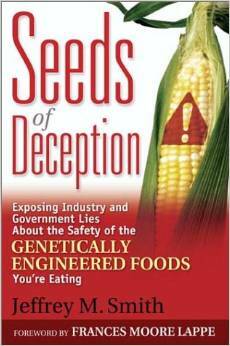 This chapter describes all the sources of GM foods and explains how to remove them from your diet. It also provides additional motivation to make a change, describing how food can dramatically influence mood and behavior. This chapter offers some practical ways to stay informed and to make a real change. One of these is to get this book into the hands of those who can make a difference. Officials around the world who are in charge of GM food policy need to be made aware of the foods’ dangers and of how their approval was based on politics, not science. They have been subjected to relentless promotion by the biotech industry and bullying by the U.S. government to accept GM foods and crops. The revelations in this book might change that. This section ties in recent events with a summary of some of the salient points from the book. There are the numerous ways in which industry researchers apparently doctored their studies to avoid finding problems with GM foods. For example, Aventis heated StarLink corn four times longer than standard before testing for intact protein; Monsanto fed mature animals diets with only one tenth of their protein derived from GM soy; researchers injected cows with one forty-seventh the amount of rbGH before testing the level of hormone in the milk and pasteurized milk 120 times longer than normal to see if the hormone was destroyed; and Monsanto used stronger acid and more than 1,250 times the amount of a digestive enzyme recommended by international standards to prove how quickly their protein degraded. Cows that got sick were dropped from Monsanto’s rbGH studies, while cows that got pregnant before treatment were counted as support that the drug didn’t interfere with fertility; differences in composition between Roundup Ready soy and natural soy were omitted from a published paper; antibody reactions by rats fed rbGH were ignored by the FDA; and deaths from rats fed the FlavrSavr tomato remain unexplained. Overturning a myth is not easy and cannot be accomplished by only a few individuals. Please join with those of us who are dedicated to getting the truth out. Inform your media and political representatives of this important information on genetically engineered foods and the GMO cover-up. To contact those close to you, click here. Read concise summaries of revealing major media reports on the GMO cover-up available here. Visit our Health Information Center at WantToKnow.info/healthinformation. Spread this news to your friends and colleagues, and bookmark this article on key news websites using the “Share” icon on this page, so that we can fill the role at which the major media is sadly failing. Together, we can make a difference. Unless otherwise indicated, quotes from Arpad Pusztai, his wife Susan, or Philip James are based on personal communications with Arpad Pusztai. Kurt Eichenwald and others, “Biotechnology Food: From the Lab to a Debacle,” New York Times, January 25, 2001. Read the full article on the Times website at this link. Kurt Eichenwald, and others, “Biotechnology Food: From the Lab to a Debacle,” The New York Times, January 25, 2001. Read the full article on the Times website at this link. It’s not just GMO food. Everyone needs to take responsibility for their health and health of family [water, air, harmful wireless technology, vaccines]. Individuals reporting the facts are trying to educate people who are unaware of globalism on the doorstep of countries world-wide. Time is short. Sharing is caring. Thank you. This entry was posted in 5G, Awakening humans, Chemtrails, Energy, frequency, vibration, GMO food and clothes, Public Notice, Science and technology, Silence is agreement. Bookmark the permalink.